I don’t know what it’s like where you grew up, but in Boston there’s only like four places open to eat 24 hours, and two of them are drive-through McDonald’s, so if you’re feeling peckish in the later hours and you’d like some waiter service, you’re pretty much at the IHOP. Now, if you’re at an IHOP in the middle of the night, chances are you are not in the soundest of mind-states for decision making. If you’ve ever seen anything along the lines of someone slumped in a comfy IHOP booth demanding an order of the coconut shrimp at 4 a.m. — despite the waiter aggressively, nearly frantically attempting to shake him off the coconut shrimp — you know what I’m talking about. 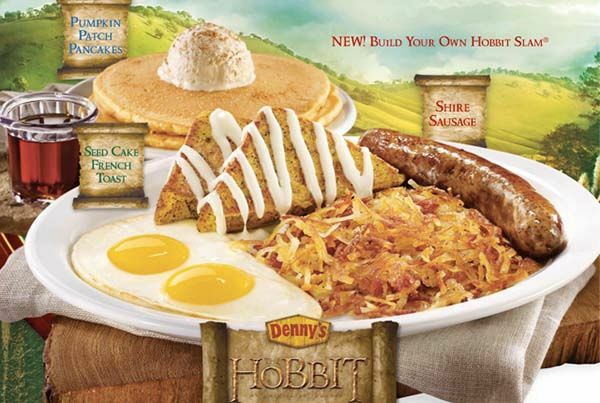 Which brings us, in a roundabout way, to Denny’s new Hobbit-based promotional offerings. On November 6, ahead of the December 14 premiere of The Hobbit, Denny’s will start offering a Tolkien-inspired breakfast menu. We’ve got Bilbo’s Berry Smoothie, Gandalf’s Gobble Melt, Hobbit Slam, Hobbit Harvest Pie, Hobbit Hole Breakfast, and, crucially, The Ring Burger (that one has onion rings on it). There’s even more, and it all sounds delicious, alliterative, and on topic. Well done, Denny’s! As important — now drunk and high people won’t stumble into self-sabotage as they unstick those plastic menus. Because what drunk or high person would ever be able to resist anything off the Hobbit menu? I’d consider making this a permanent institution, Denny’s. And IHOP, I’d consider taking some notes?